Are you looking for an effective material to move your goods and other valuable things? Then, heavy-duty moving boxes are perfect for your moving needs. It can safely move your personal items from one location to another. Heavy duty cardboard boxes can provide you with the help you need to move. These are summed up in the following list. Heavy duty cardboard boxes are long-lasting, so you can make sure that you can move your items safely from one place to another. It is better than plastic containers since they can be flat packed. It allows you to store away when not in use. Plastic takes space to store while heavy-duty boxes can be stored away without the need of big space. Compared to other moving materials, heavy duty Moving boxes are more affordable. If you are a person who is conscious to budget, then it is perfect for you. With this, you can move your goods without spending much of your hard-earned money compared to replacing broken china. When you are moving home, the use of this moving box can help you to avoid financial burden of replacing damaged items. It will also provide you with peace of mind and hassle-free moving procedure. 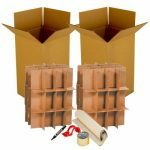 These moving boxes are the best packing solutions when you are looking for high-quality but affordable moving materials. You can use it with more customized and standardized designs such as the kitchen boxes with glass and dish inserts. It is also effective to reduce damages during the transportation process. It lessens the cost due to its material savings. With the use of heavy-duty boxes, you can save more of your packing time and other related costs. There are varieties of products available in the market. One of the best companies that can provide you with excellent quality heavy duty boxes is Uboxes.com. They offer a wide selection of moving boxes. Heavy duty shipping boxes are 100% recyclable and environment-friendly. With the use of this packaging material, you can keep the nature from harmful chemicals that can damage it. You can flat pack the boxes according to your needs. This type of box is highly recyclable, so you can use it for different purposes. The following are some of the best ideas on how to recycle it.